Package contains six - 18 inch quilt blocks Girl's basketball. 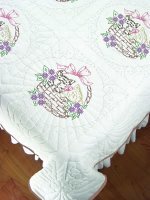 The pattern is cross stitch, and DOES have quilting marks. OPTIONAL BORDER BLOCKS ARE AVAILABLE. Please see below for all coordinating items. Floss, hoop, batting, and backing not included.